Great holiday home for couples as there are 5 (Double/Queen /King) beds and 3 bathrooms. The house is situated in a quiet cul-de-sac but only a short walk to the lake edge at 2 Mile Bay.The main living area is upstairs. The lounge has sliding doors that lead out onto the deck with views of the lake. There are 3 bedrooms( 1 with en suite), the main bathroom and the laundry on this level .Downstairs there are a further 2 bedrooms and a bathroom as well as another lounge/ kitchen area. 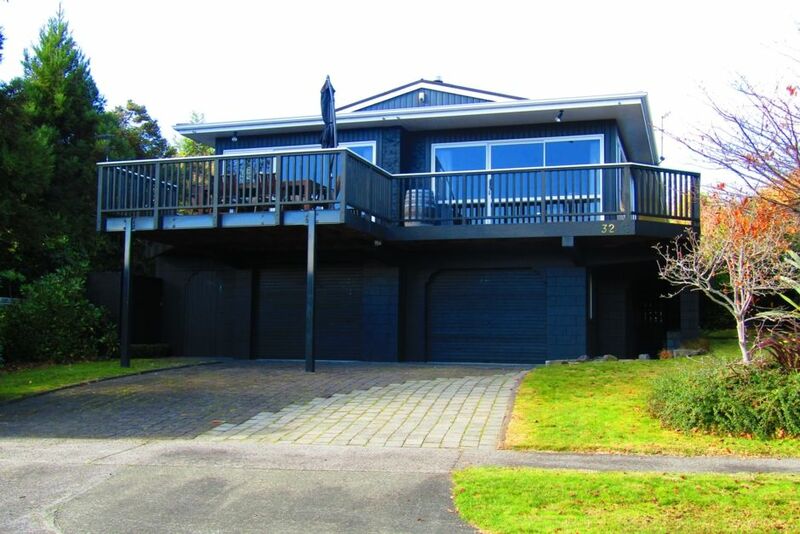 There are local shops (Dairy, Fish and Chip shop , Hairdressers and Liquor shop )approximately 250 m up the road or walk into town along the lake front path way.Garage for parking one car and a further 2 cars can be parked in the driveway. This property has Wi-Fi and Sky including the Sports Channels. The home was extremely well equipped and furnished (more up to date than in pics! ), spacious too. Mainly queen beds was a bonus. Great for a family or group stay - could quite easily have settled in for a week! Good parking too. Needs a bit of TLC but overall a wonderful place to stay and had everything we needed, would highly recommend this place for families wanting to stay together but also wanting their own space. We are three families with young children and we had a great stay at this property. The décor is dated but it was clean and a great size and layout for our large group. The deck is perfect for BBQ dinners, with a lake view, and the back garden is fenced. Just one tip - book direct with Harcourts Holiday Homes to save on booking fees. Very dated but had everything we needed. Very dated but had everything we needed. We had three families staying with kids (12 in all) and we fitted very comfortably. Only a.short walk to the lake with the bikes. Fire was amazing and burnt through the night. We'll be back I'm sure. The property was very neat and tidy. The property was very neat and tidy. Beautiful house but had issues with hot water. Great house. Was ideal for our two family's children and Grand mother. Nice quiet street with a bit of a view of the lake. Would recommend without hesitation to others.